In Figure #8, the “Jitterbug portion” is the actual path that vertices will travel (direction of travel is not considered here.) 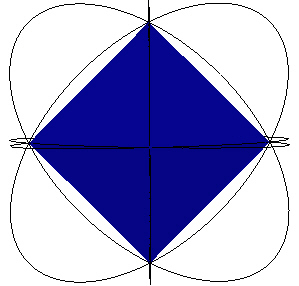 No vertex of the Jitterbug (when considering only the Octahedron to VE to Octahedron motion) traverses that portion of the ellipse curve which is within the “Square cross section of Octahedron” portion of the ellipse. (See Figure #8.) Later in this paper we will consider what happens if the vertices are allowed to move around the complete ellipse. Figure #8 shows the complete ellipse in the YZ-plane with the usual Jitterbug vertex path portion of the ellipse marked. In the following sections of this paper we will explore the consequences of allowing the vertices of the Jitterbug to orbit around the entire ellipse. 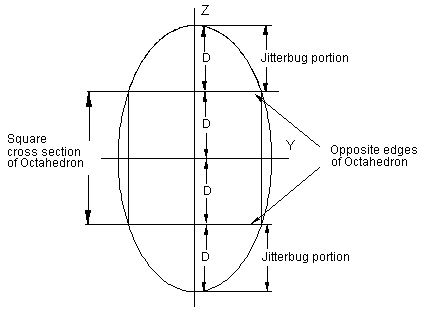 Note that there are 2 diametrically opposite Jitterbug vertices per ellipse which travel in the same direction. So there are two “Jitterbug portions” to the ellipse. 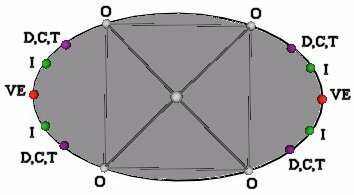 Since there are 12 vertices to the Jitterbug (not in the Octahedron position) then there are 12/2 = 6 total ellipses for the Jitterbug. 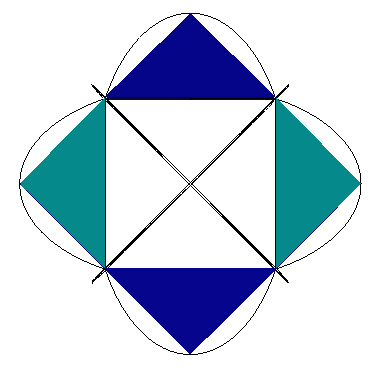 All four of the square’s edges in the ellipse of Figure #8 are Octahedron edges. 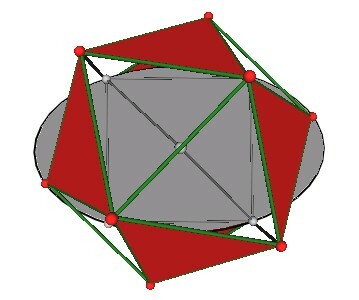 Each pair of opposite edges of the Octahedron is part of an ellipse. 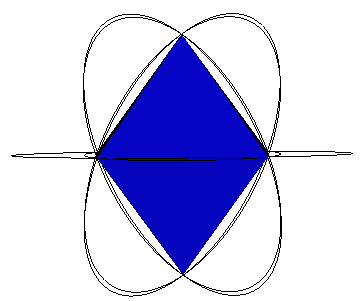 Therefore, there are two orthogonal ellipses in the same plane. 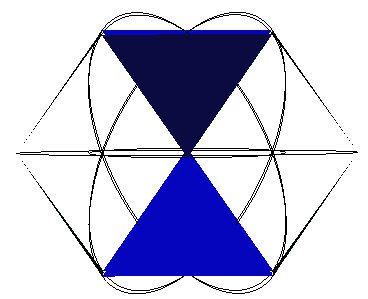 Figure #9 shows both ellipses defined by the motion of 4 Jitterbug vertices. Following only one vertex (one vertex of a rotating Jitterbug triangle) and with the Jitterbug in the Octahedron position, we label the initial vertex position “P1”. This vertex will travel along the ellipse, passing through an Icosahedron position, to reach vertex position “P2”, the VE vertex position. 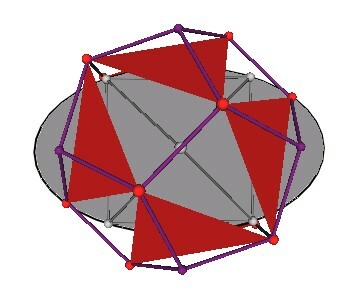 Then, with the Jitterbug triangle continuing to rotate in the same direction, the Jitterbug vertex passes through another Icosahedron vertex position to reach the Octahedron position “P3”. 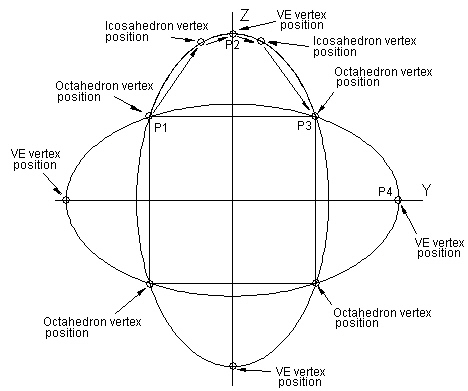 (Further details relating the Jitterbug vertex position along the ellipse and various polyhedra are given below.) Note that if the Jitterbug triangles were allowed to continue to rotate in the same direction then the vertex now at vertex position “P3” would not proceed to vertex position “P4”. Instead, is leaves this plane to follow another ellipse. The Octahedron has 12 edges forming 6 opposite edge pairs. So there are a total of 6 ellipses to define the complete Jitterbug motion. These 6 ellipses are show in Figure #10 and Figure #11. The Jitterbug in the VE position is shown in Figure #15. 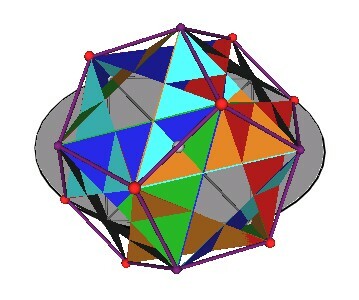 Because of the symmetry of the elliptical path about its semimajor axis, a Jitterbug vertex will pass through 2 Icosahedra and 2 regular Dodecahedra positions. These are shown in Figure #16. 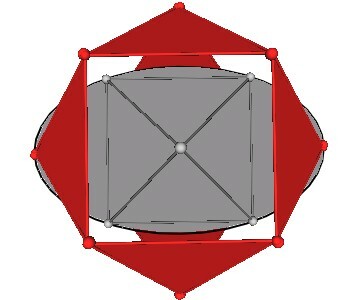 The vertex positions labeled “D,C,T” stand for the “Dodecahedron, Cube, Tetrahedron” position. 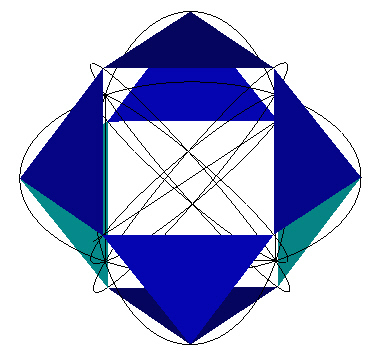 (It is well known that 5 Cubes and 10 Tetrahedra share the same vertices as a regular Dodecahedron.) 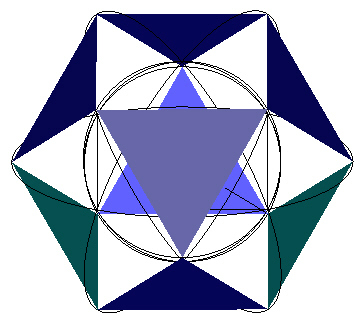 The positions labeled “O” are the Octahedron positions, those labeled “I” are the Icosahedron positions, and those labeled “VE” are the VE positions. 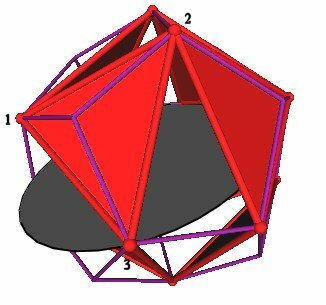 We can calculate the angular amount g that the Jitterbug triangle rotates from the VE ( g =0°) position into the Icosahedron position (g I). Here, we have V = DVFI for equation (4). Which gives g I @ 22.23875609°. 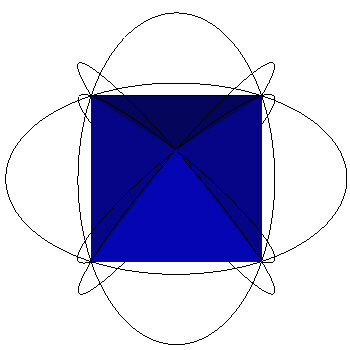 from the VE position (clockwise or counter clockwise) to be in the Icosahedron position. Note that the triangles of the Jitterbug are like gears in that if a triangle is rotated clockwise, then the 3 triangles attached to it must rotate counterclockwise. 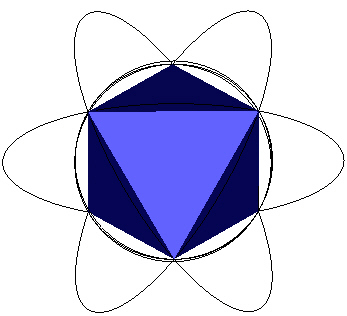 which is the angle about the X-axis that the ellipse radius rotates to the Icosahedron position. 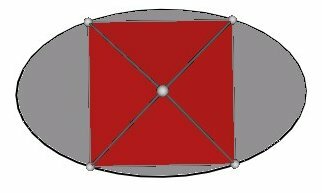 To calculate the angular rotation of the Jitterbug triangles for the regular Dodecahedron position, we first find the radial position of one of the Jitterbug’s triangles when in the Dodecahedron position. from the center of volume. This is the angular amount that the Jitterbug triangle is rotated about the V-axis from the VE position to the Dodecahedron position.